In the recent years there has been an emergence of self-use or at-home devices that promote permanent hair removal results. While permanent hair removal is a possibility within a professional setting, it is not completely achievable at home. This article will discuss what permanent hair removal really means and what kind if results you can expect from laser and IPL at-home machines. Permanent Hair Removal: Electrolysis​Is Permanent Really Permanent? Electrolysis is the only form of permanent hair removal currently approved by the FDA. This means that no other forms have been tried, tested and federally approved as a method of permanent hair removal. Electrolysis can only be performed professionally by a physician. As it stands, there are machines on the market that claim to provide you with the same permanence as you would experience with a professional. We do not, however, recommend trying any type of home electrolysis equipment as it is possible to cause permanent skin damage and scarring if not carried out correctly, and there is no guarantee the results will be permanent or even semi-permanent. Electrolysis is performed by inserting a very thin probe into the hair follicle. An electrical current is then applied to the follicle in order to damage it permanently and therefore stop any hair regrowth. Electrolysis works on any type of hair and hair color, whereas laser hair removal treatments only work on darker hair. While the procedure of Electrolysis, treating each hair one by one, steers it towards being the most permanent of hair removal methods, it also makes it a lot more time consuming than any other method. Electrolysis is really only suitable for smaller treatment areas, such as the chin or upper lip, as a larger area would just take too long to see any kind of results. Electrolysis requires multiple treatments, is the most costly form of hair removal and, as it is invasive, it can end up being somewhat painful. It is always advised to make sure you use a reputable physician when opting for Electrolysis. Even when you treat your hair with a removal method that is considered permanent (Electrolysis) or semi-permanent (laser or IPL), you still may see a recurrence of hair growth months or even years after you have had the treatment. This is because in order for these treatments to work successfully, they need to attack the hair in a specific part of its life cycle (during the Anagen or “growth” phase). For this reason it is necessary to space out treatments every few weeks in hopes of attacking the hairs at the right time. Even then, it is possible for hair to reappear when you experience sudden hormone changes in your body (pregnancy or menopause for example). A certified Electrolysis or laser specialist will explain this in detail before you go ahead with any treatment. So, when all is said and done, permanent hair removal is as permanent as possible under the circumstances. 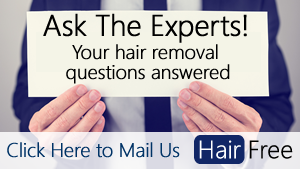 ​When it comes to permanent hair removal at home, there are no tried and true methods. It is strongly advised not to try Electrolysis at home as it is an invasive treatment and should only be performed by a certified physician. While Electrolysis is the only form of permanent hair removal, laser hair removal can also provide significant results. Apart from the professional laser treatment option, there are also a few FDA approved laser hair removal treatment kits on the market. The reason the FDA was able to approve certain at-home laser kits is because they operate at a lower fluence than a professional machine, which makes them less effective but much safer when used by a non-professional. This said, although the at-home device is not as efficient as the professional one, clinical trials have proven them to yield results in at least hair reduction, if not semi permanent hair removal. The at-home kits are definitely cheaper than the professional treatments, although they are still on the pricier side in regards to more traditional hair removal options (razors or wax). While professional laser treatment can now be done on all types of skin colors, it is still only effective on darker hairs. On top of only working on darker hairs, at home kits can only be used on skin colors ranging from I to IV on the Fitzpatrick scale. Clinical studies provide varying results of success, some showing a marked reduction in hair after a few sessions or after long-term treatment, others not so much. This can all be down to the person using the machine, their skin and hair colors, area on the body treated, frequency of use and on the level of intensity used. Are the Home Kits Safe? The at-home kits that have been approved by the FDA are safe, as long as you follow the instructions correctly – most of them even detect skin color and will auto-lock if they detect anything over IV on the Fitzpatrick scale. These machines are priced between $200 and $700, and if you purchase one with a replaceable cartridge the replacements range from $20 to $100 depending on the machine. Most machines come with a replaceable cartridge, so when you are researching the best one to buy you should also look at how long the cartridge will last based on usage, check how much a replacement costs, and work out if it is cost effective for you. Those that do not come with a replaceable cartridge are usually more expensive, such as the Tria 4X, but at some point in time the entire machine will need to be replaced if it is used very frequently. Laser treatment can go from painless to painful depending on the individual, and it is often easier to get through a treatment when a professional is doing it rather than when you are doing it to yourself. You can use a topical anesthetizing cream before you go ahead if you find it painful, but this may lessen the effectiveness of the treatment. Normally, the higher the intensity, the better the result, so you need to be prepared to up the intensity if you want to see real results. At the same time, if you don’t mind the possible irritation or pain, or the gamble of the treatment possibly not rendering the results you expect , these kits make it possible to do your own laser treatment in the privacy and comfort of your own home. As Electrolysis is the only permanent form of hair removal that currently exists, it is not possible to achieve permanent hair removal at home right now. However, if your aim is a reduction in hair regrowth, you are not ready to spend the money required for professional laser treatments and your skin color is below V on the Fitzpatrick scale then purchasing an at home laser kit is a good option. You can use it comfortably in your own home, and there is a good chance that you will see at least some results, from having to use other hair removal products (shaving, waxing) less frequently to patches of hair not growing back at all. We always recommend only using FDA-approved devices. Currently, the only laser hair removal or IPL devices approved by the FDA are the following: Tria 4x, SilknSenseEpil, Remington IPL.